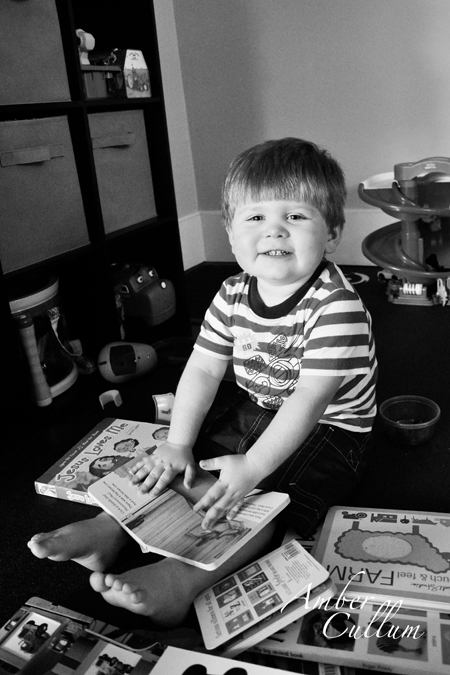 Last year I wrote about B's favorite books from his first year of life a day after his birthday. Since he will be turning two next week and it is so easy to forget the things he does from year to year I wanted to continue the trend. 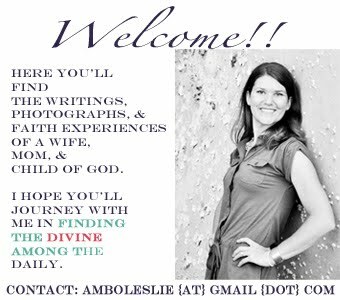 Plus, most of the books we read have been the result of a recommendation from a family member, a friend, or a blog. 1. Good Night, Gorilla - I first read a review of this book at No Time For Flash Cards. Then, I ordered and received the book in the mail and thought, "This doesn't seem like a book Bennett would enjoy." Wow, was I WRONG!?!?! He has loved this book since the first time we opened it. 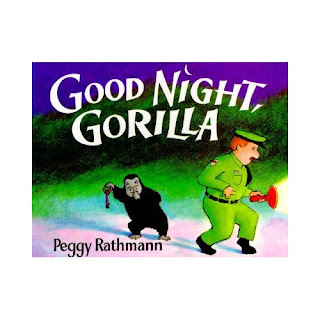 This book is about a sneaky gorilla who let's all of the animals out of their cage. There are several pages without words, but the illustrations tell the story wonderfully. Plus, several illustrations are filled with details that are fun to have your child point out. 2. Little Blue Truck - B received this book for his first birthday, so it was included in last year's list. 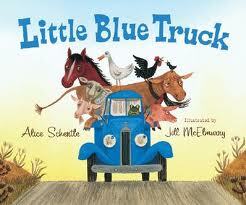 It has continued to be a favorite, along with Little Blue Truck Leads the Way . Both books are based on the value of being kind to others. 3. If You Give a Moose a Muffin (and all of the others in this series)- My sister-in-law has four children, so it is not surprising that all of the books she has gifted B have become his favorites. This is a story about a moose who was given a muffin resulting in several random requests that runs his friend ragged eventually leading back to a muffin. This is a great circular story that includes phrases my son frequently repeats. I would recommend every story in the If You Give Set . 4. 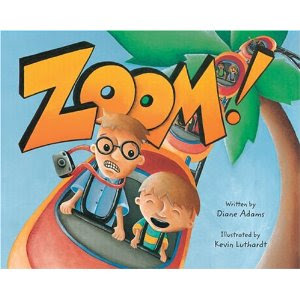 Zoom!-We do not own this book, but it was an accidental library find. I quickly picked it up one day, because I saw a dinosaur on one of the pages. B loved it and asked me to read it to me multiple times per day. It's a story about a father and son who ride the dino-coaster. The son is very scared to get ride the coaster, but by the end it is the dad who is ready for the ride to be over. Overall, this is simply a fun story and a great read for those who like dinosaurs. 5. 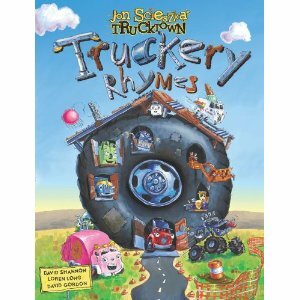 Truckery Rhymes -I initially heard my sister reading this book to my nephew when B was just a baby. It stuck with me as it is a fun twist on common nursery rhymes. When B began showing an interest in cars and trucks I decided to gift him this book for Christmas. He enjoys naming the various vehicles and hearing several of the rhymes. His favorite's are Three Loud Trucks (to the tune of Three Blind Mice) and Pop! Blows the Diesel (to the tune of Pop Goes the Weasel). 6. 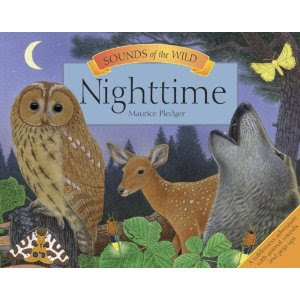 Sounds of the Wild: Nighttime - This book was a Christmas gift from B's grandparents. While the story is too advanced for him to follow at this time, he loves the nature sounds that accompany each page. This is a pop-up book with several animals that he enjoys pointing out and naming. This is definitely a bedtime favorite and one that I would highly recommend if your child loves animals and is gentle with pop up books. 7. Flap Books (All Around Chuggington , Let's Go To The Farm , Buddy and the Nature Trackers )- B loves flap books and for that I am grateful. 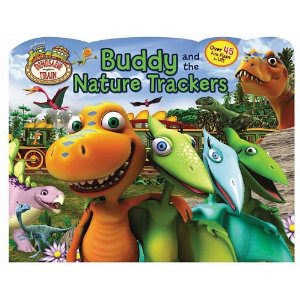 At his age, they are very engaging and provide the opportunity for him to learn about shapes, colors, numbers, animal sounds, and in the case of Buddy and the Nature Trackers action verbs. I hope I never forget his expression of excitement when he names a train, color, or shape correctly before opening the flap. It was a favorite last year and continues to intermittently be a bedtime favorite this year. He continues to enjoy touching the fur of each animal, but more than that he enjoys opening the pages to reveal the "good night" portion of each animal. Each page has a few sentences and illustration that focuses on the day. Then, you open the page to reveal a few sentences and an illustration that focuses on sleeping. 9. It's Great to Be an Engine - After spending Thanksgiving with my sister's family Bennett became obsessed with all things Thomas. While the obsession was short lived, he continues to enjoy trains and songs involving Thomas the Train. 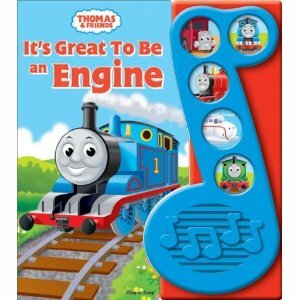 This book has several of the more popular Thomas songs with the words included on each page. During the last month B has began singing the Thomas theme song, which is totally adorable. 10. 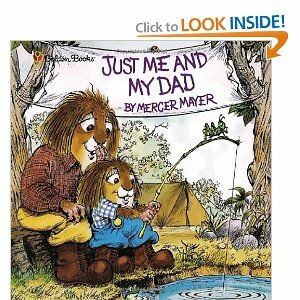 Just Me and My Dad - And last, but certainly not least, is this book about a father/son camping trip. B simply adores this book. He loves the story and enjoys finding the spider and grasshopper on each page. Is your child 2 to 3 years old? Do you have any favorite books you would recommend? *The above links are affiliate links. I do benefit if you buy from the links, but it is no additional cost to you. Note: Several of the above books are not board books. If you need board books and plan to order from the links I provided, please read the fine print. 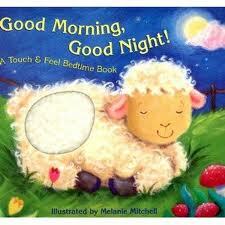 My daughter has the "Just Me And Dad", and "Good Morning Good Night" books and has me read them to her almost nightly. Great books! 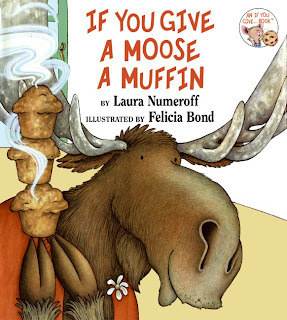 I'd really like to get the "If You Give A Moose A Muffin". Have a great weekend! I never buy flap books, though... the toddlers I know have always destroyed them, lol. Maybe I should give A a chance! "Goodnight Goodnight Construction Site" is cute, epecially for kids that love trucks. His favorite Thomas book is "Crack in the Track". "The Little Engine that Could" is also a fave. We read the Sesame Street book "Don't Forget The Oatmeal" a lot when he was about 2.5. We've been getting Todd Parr books from the library. The "Do's and Don'ts" book always made him laugh. Right now he has a book called "Otis" about a tractor. He loves the book so much he's renamed one of his toy tractors Otis!